This week is Coeliac Awareness Week! Coeliac UK have launched the Gluten Freevolution fronted by their chirpy mascot Cyril the Duck. Their campaign messages aims to promote knowledge of coeliac disease amongst caterers, retailers and independent food businesses. In celebration of this I have put together this list of gluten free life hacks, aimed at coeliacs, particularly those who have been newly diagnosed. There is a whole gluten free community out there ready to lend their support and advice whenever you need it. Search #coeliac and follow all your fellow gluten free-ers. They really are a lifeline. These are places that fall in with strict guidelines on cross contamination and food preparation. They include all sorts of delicious places including Pizza Express, Carluccio’s and Côte Brasserie, where they even put little gluten free flags in your food! In order to avoid cross contamination from gluteny toasters then the best thing to invest in is a packet of toaster bags, so that you can make your toast creations safely in the knowledge that they will remain gluten free. It’s also very important to use separate chopping boards and utensils to avoid cross contamination. Make gluten free cakes using standard recipes. All you need is xanthan gum (I use 1/4 tsp per 200g flour in my cake recipes) and extra liquid- milk works well. See here to find out how! Swap your old gluten filled favourites for gluten free equivalents. Gone are the days of crumbly dry bricks of ‘bread’. With the gluten free industry booming, there are countless brands out there making gluten free products which are genuinely tasty! You can find alternative gluten free, wraps, cakes, bread rolls, croissants, pastries and beer. Here are just some of my favourites! Over the past few years M&S have rolled out a very extensive range of gluten free products featuring everything from Macaroni Cheese to Meatball Wraps and Dinky Sausage Rolls, all gluten free but incredibly tasty. They have repeatedly demonstrated their commitment to providing tasty allergen friendly alternatives and are even sponsoring the Gluten Freevolution. Thumbs up from the whole coeliac community! I particularly love their seasonal Christmas products- this year’s snack packet of gluten free Pigs in Blankets was nothing short of genius! It lists thousands of gluten free products from all the major retailers and companies. You can also download the app version Gluten Free On The Move, which will send you instant updates whenever a product is recalled. Going abroad with a food intolerance may seem daunting but there are lots of gluten free brands and restaurants in other countries just waiting to be discovered. Google gluten free along with your destination name and you are guaranteed to come across blog posts from fellow coeliacs, full of handy tips. Last year I went to Alicante and was able to eat tapas, paella and icecream and even drink gluten free beer! However heard you try, there will be instances when you’re out and about and you just can’t find anything that’s gluten free. For this reason it makes sense to always carry snacks with you, whether it’s gluten free popcorn, oatcakes, cereal bars or fresh fruit. Although oats are naturally gluten free, if you’re a coeliac, you should buy them from a dedicated gluten free brand as normal varieties are contaminated with other grains. A very small number of coeliacs are sensitive even to gluten free oats. Coeliac UK have lots of advice on this. If you decide to include oats in your diet then granola may well become your new favourite breakfast! And there you have it! 10 ways to make coeliac life that just a little bit easier! Join the Gluten Freevolution here and help to spread the word! After a tricksy technical challenge which everyone struggled to get perfect, the bakers were tasked with making huge bread sculptures featuring three natural colours. Lots of them used squid ink which turned the bread an alarming dark grey colourand two bakers chose to make octopuses whilst most of the others went for an animal or plant. Whilst nothing could ever beat Paul’s lion sculpture from series 6, Steven bread bag was extremely impressive and so, so detailed, featuring a chain strap made of bread sticks and even some stitching detail. For this week’s baking challenge I have made a rather chubby giraffe shaped loaf of bread! It’s made using Bakel’s Gluten Free Multiseed Bread Mix, to which I added turmeric for the yellow colour, along with some cumin and oregano. Following the instructions on the packet was nice and easy and even though it’s gluten free, the bread tasted soft and springy and not at all dry. Here’s a snap from before it started proving, looking slightly more elegant! And here’s a cross section of the bread so you can see the lovely bright yellow colour! Next week is caramel week and I spotted millionaire’s shortbread in the trailer. My idea of HEAVEN! The Great British Bake Off is finally back on our screens!! As an avid fan, I couldn’t resist reinstating my annual Bake Off blog posts, where I take one of the weekly challenges and recreate it with gluten free ingredients. This week I decided to tackle the illusion cake, a tricky task given to the bakers as their Showstopper Challenge. I have created these ‘chicken nuggets’ which are actually gluten free mini Salted Caramel Praline Cakes! There has been a lot of controversy about whether or not this series would be worth watching. Whilst many remained adamant that nothing could beat Mary Berry, I couldn’t turn down the chance to take a peek at the new series. And it more or less worked! The jokes from Noel and Sandi were a little quiet and apologetic, whilst Prue didn’t seem as reassuring as Mary, but I think it has real potential. Channel 4 have chosen to keep the format almost exactly the same (apart from those pesky adverts!) which was a real relief. My favourite baker so far has to be Flo. I will never say ‘lemon currrrrd’ in the same way again! 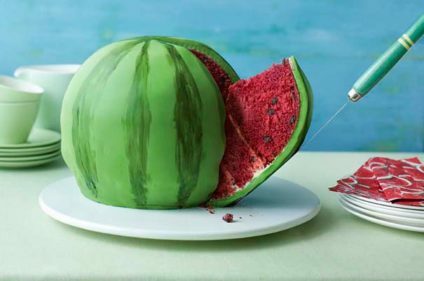 And her watermelon cake was so cleverly simple and vibrant. Steven meanwhile nabbed Star Baker with his epic sandwich creation, which was well deserved. For this week’s Bake Off Challenge I have created mini chicken nugget illusion cakes. As I’m a coeliac they’re 100% gluten free. First I baked a batch of caramel cake by taking a normal gluten free vanilla cake recipe and substituting in light brown sugar instead of caster sugar. I baked it in a square tin and left it to cool. Next I made a batch of Salted Almond Brittle using BBC Good Food’s brilliant recipe. I left it to cool then whizzed it up in a food processor until it formed fine crumbs. Then I added two handfuls of gluten free cornflakes and whizzed again to make my ‘breadcrumbs’. Finally I made a small bowl of vanilla buttercream icing and stirred in some cooled melted gluten free white chocolate. Finally I set up an assembly line, cutting up squares of cake into ‘chicken pieces’, spreading them in icing and then dipping them in the ‘breadcrumbs’. To serve, I put them on a plate with a bowl of strawberry jam, mixed with melted white chocolate and a spot of food colouring to create that ketchupy colour. Next week looks very tense indeed. The trailer hinted at fortune cookies, board game biscuits and multiple breakages. I can’t wait to tune in again! Chocolate Fudge Cake. Three words which join together to form a truly decadent pudding! I made this cake using the Betty Crocker Gluten Free Devil’s Food Cake Mix which I found in Morrisons. They have recently expanded their Free From range and have a really tempting selection of bakery and frozen products including these Curly Fries! ​Although the packet recommends that you ice the cake with Betty Crocker icing, I made my own Chocolate Cheesecake Icing and I’ve written the recipe out for it below. This was a Father’s Day treat for our lovely dad- Happy Father’s Day to him! I will definitely be stocking up on more mixes for future celebrations! See more gluten free reviews from my blog here! Do you remember when you were younger that you would happily eat the same food every day? I think I took the same lunch to school everyday for years! Well at the moment I seem to have got into the habit of eating yogurt and granola for breakfast EVERY day! So I thought I’d mix it up a bit this week and try coming up with a new breakfast recipe. I’ve never tried making overnight oats before but I’ve always admired them on Instagram, often piled up into huge jars and topped with dizzying amounts of fruit! This is a slightly more pared down version using a mixture of gluten free oats and Nutri-Brex– a super yummy and healthy gluten free version of Wheetabix made with sorghum which has a lovely slightly nutty flavour. The finished result paired with a morning cup of coffee is very tasty indeed and tastes a lot like having pudding for breakfast! Fill the base of a small bowl or ramekin with a generous amount of rhubarb compote. In a separate bowl, mix together the Nutri-Brex, gluten free oats and milk. Pour on top of the rhubarb, completely covering it and leave in the fridge overnight. The next morning, make a deliciously strong cup of coffee in your favourite mug then dig into your breakfast! It’s extra tasty served with yogurt and a handful of crunchy gluten free granola. If you’re mega hungry, just scale up the ingredients! This year I thought I would join the Valentine’s Day bandwagon by making something suitable pink themed. But instead of wrestling with tubes of pink icing gel or battling with piping bags, I’ve conjured up something savoury instead. Although it looks very innocent, this soup has a really spicy kick which balances out the relentlessly earthy taste of the beetroot really quite well. If you’re feeling particularly adventurous then add in a cheeky spoonful of horseradish sauce which is a perfect partner to beetroot. The heart shaped bread is definitely optional but look how cute it is! Thinly slice 1 large onion and saute in a frying pan over a low heat until pale and translucent. Chop up half a swede, one eating apple and two sticks of celery then add to the pan and sizzle for 5 minutes along with a pinch of ginger and a sprinkling of chilli flakes. Whizz up the cooked vegetables with a handheld soup blender then serve to your one true love with extra chilli flakes and toast! And if you’re in a romantic mood then you can discover more of my Valentine’s themed recipes here! At the end of November last year I flew out to Düsseldorf to see the Christmas markets. Having lived and worked in the Düsseldorf region for a year as part of my university degree I was really excited to return to all of my favourite year abroad haunts! And even more excited when I discovered that a brand new gluten free patisserie had opened on the Königsallee. The original Isabella’s Gluten Free Patisserie is based on Arnulfstraße, a short tram ride out of the city centre. The shop that I visited on Königsallee is a new mini outpost which has only been open since the summer. They sell a wide range of cakes, pastries, mousses and savoury snacks including sandwiches and quiches and absolutely everything is gluten free. Finding the shop is a bit of challenge, because it’s not directly on the main street. Instead, you have to go into the Kö Galerie, which is a mini shopping arcade. As you come to the escalators going down to Rewe, a popular German supermarket, then turn right and you’ll find it tucked away on the right hand side. Completely spoilt for choice, I took ages to pick out a cake because they all looked so beautiful and tempting! This blackcurrant mousse cake had a hidden chocolate centre, giving it a perfect balance of flavours. This gluten free chocolate eclair tasted utterly delicious! And it was beautifully presented too- a far cry from the classic green packaging of free from food in the UK. It’s not all about the cakes! They had some delicious sandwich and lunch time options too. I tried this spinach and pine nut quiche. The pastry was just right- not at all dry.The patisserie also sells fresh gluten free bread and bread rolls, so you can make you own lunch. On November 11th Germany celebrates St Martin’s Day. According to legend, St Martin was a knight who was riding along the road when he saw beggar who was freezing cold. He used his sword to cut his cloak and gave half to the beggar, thus saving him from freezing to death. During the evening of 11th children traditionally take part in a St Martin’s day procession, carrying colourful lanterns. As part of the celebrations bakeries produce a traditional man-shaped bread roll called a Weckmann, complete with a clay pipe and raisin eyes. It’s a sweet dough, much like a brioche and I was very excited to discover this tasty gluten free version! At Christmas time, Germans love to make Weinachtsplätzchen, otherwise known as Christmas cookies. I bought these gluten free ‘Nussecken’ which directly translates as ‘Nutty Corners’, presumably because of their triangular shape! They were delicious with a cup of coffee- I will definitely be trying to recreate them at home. So there you have it, my round up of all the very best gluten free bakes from Isabella’s! Dusseldorf in general is great for gluten free food, if you know where to look. My Gluten Free Guide has written a fantastic post about their experiences of the city so I will hand you over to them for further inspiration! Welcome to Laura Pie. My name is Laura and I'm a coeliac. I utterly love gluten free baking and started this blog to chart my culinary adventures. I'm a particularly big fan of food photography, gluten free restaurants and CAKES!